The rise of USB 3.0 as a high speed interface for PCs and the increasing affordability of flash memory has led to some very interesting products. USB flash drives are a dime a dozen, but there is scope for manufacturers to differentiate themselves. We have already looked at the Corsair Flash Voyager GTX, which brought in a Phison controller into the flash driver market. Despite the presence of a USB 3.0 - SATA bridge chip, the unit supported all the important SSD functionalities such as TRIM and overprovisioning. 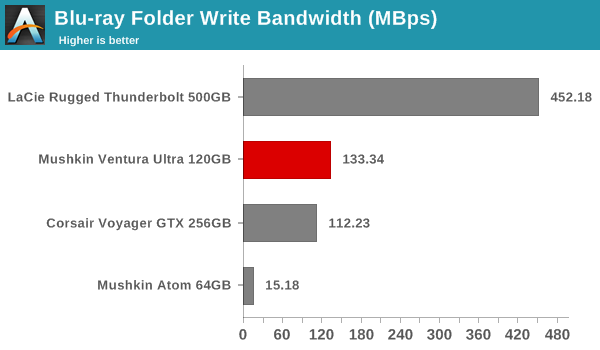 Prior to the Corsair's Voyager GTX introduction, Mushkin actually demonstrated and brought a SSD controller-based USB 3.0 flash drive to the market in the Ventura Ultra series. The Mushkin Ventura Ultra series is based on the Sandforce SF-2281 controller. 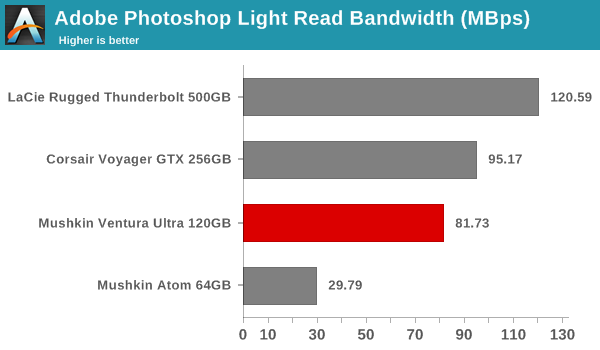 SSDs based on that controller have been in the market for quite some time. The firmware is quite mature now. The bridge chip used in the drives is the ASMedia 1053E. Mushkin also tagged along a 64 GB Atom USB 3.0 drive (that we briefly saw at CES earlier this year) with the Ventura Ultra review sample. The rest of the review will present the DAS (direct-attached storage) benchmark numbers from our evaluation of the two devices, along with a few observations. Evaluation of DAS units on Windows is done with the testbed outlined in the table below. For devices with USB 3.0 connections (such as the Ventura Ultra and Atom flash drives being considered today), we utilize the USB 3.0 port directly hanging off the PCH. 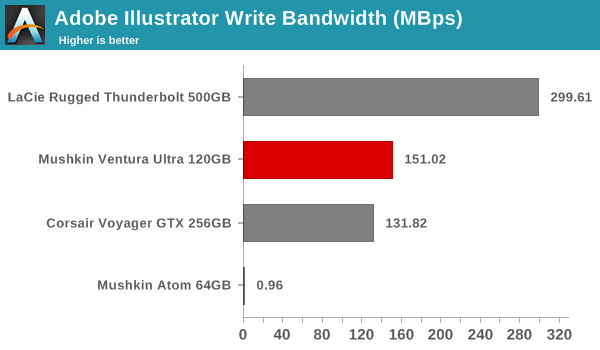 Mushkin claims read and write speeds of 445 MBps and 440 MBps respectively for the 120GB Ventura Ultra. 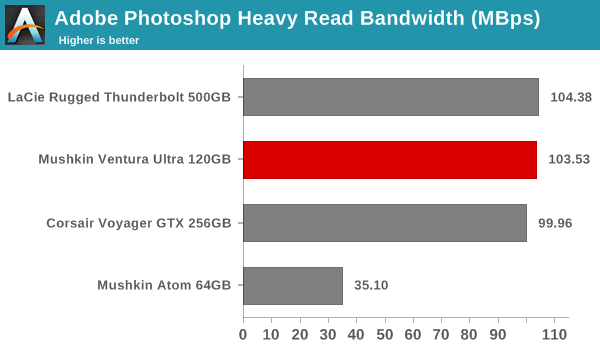 These are backed up by the ATTO benchmarks provided below. The Atom version claims read and write speeds of 120 and 20 MBps. We don't see anywhere close to those numbers in ATTO, though some of our other benchmarks (detailed further down) do come a bit close. Unfortunately, the numbers provided by ATTO are not directly applicable to most real-life scenarios. 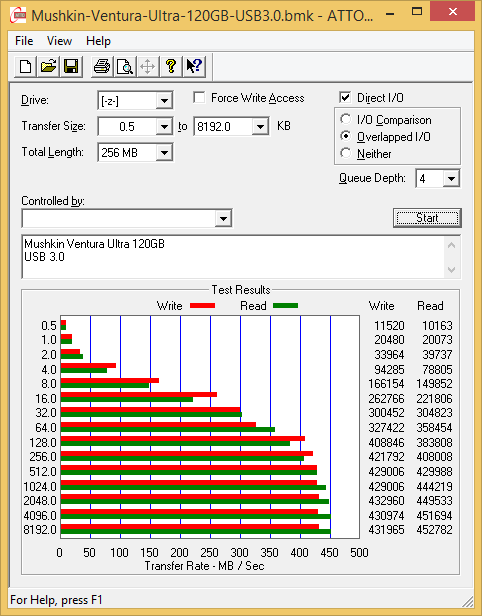 It must be noted that the SF-2281 drives tend to perform well with compressible data (as the controller does on-the-fly compression and de-duplication to reduce NAND wear). The data used by ATTO for testing can't be configured and might turn out to be compressible, tending to favor the SandForce SF-2281 controller more. 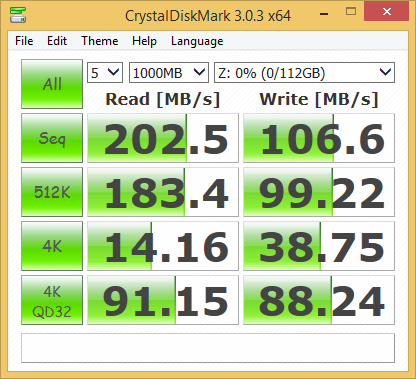 CrystalDiskMark, despite being a canned benchmark, provides a better estimate of the performance range with a selected set of numbers. As evident from the screenshot below, the performance can dip to as low as 14 MBps for the Ventura Ultra for 4K random accesses. The less said about the Atom drive here, the better it is. In any case, the Atom is not being marketed for its transfer rate capabilities. 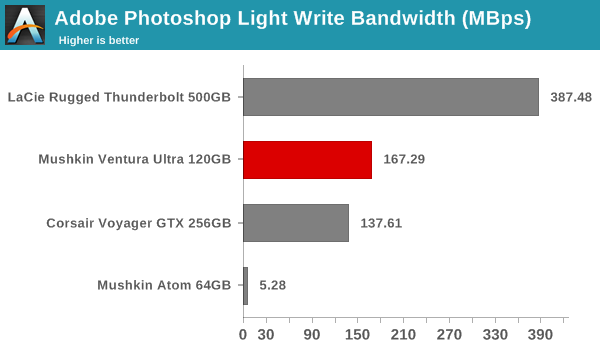 The 500 GB LaCie Rugged Thunderbolt wins all benchmark hands down. However, as we shall see further down, it is also the costliest of the lot. The form factor also doesn't match up to those of a typical flash drive. 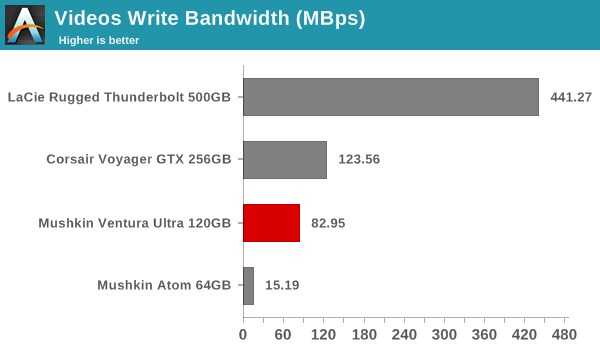 Between the Ventura Ultra and the Voyager GTX, there isn't much separation in the write benchmarks. 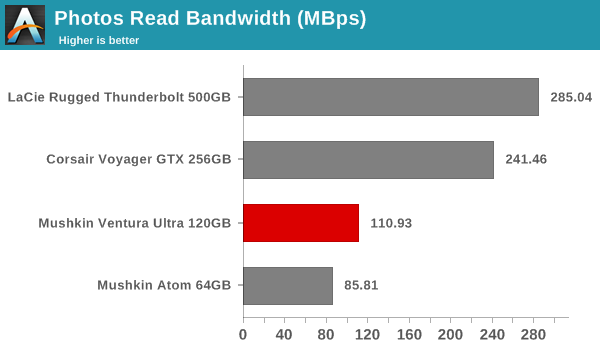 However, the reads present a different story - the Ventura Ultra lags by quite a bit. 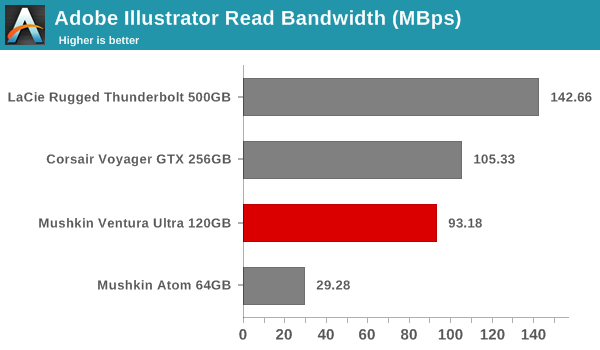 We also see the 64GB Atom provide 100 MBps+ read speeds for some workloads. In these benchmarks, the Ventura Ultra and Voyager GTX are more evenly matched, trading honors depending on the workload. 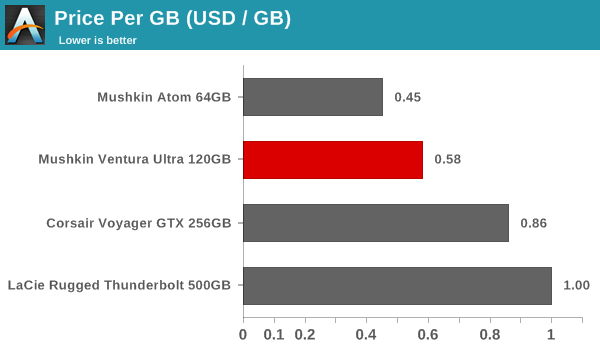 It must be remembered that the toss-up between the Ventura Ultra and the Voyager GTX is not exactly an apples-to-apples comparison because of the difference in the capacities. Coming to the business end of the review, the Ventura Ultra keeps up Mushkin's claims of being one of the fastest flash drives in the market. The icing on the cake is the presence of a real SSD controller in the form of the SandForce SF2281 inside. The performance of the drive leaves us with no doubt that it would be a great portable OS drive, even though Mushkin doesn't advertise it for that purpose. 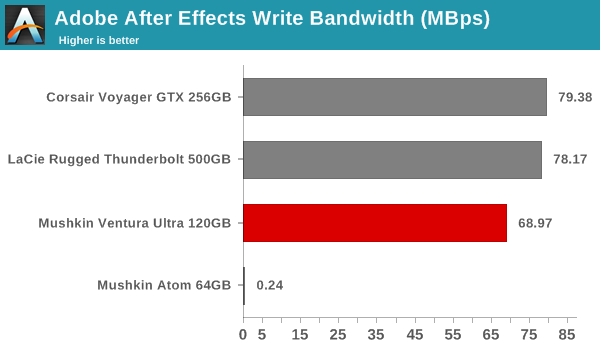 The Atom series, on the other hand, is nothing great when it comes to performance. However, the miniature size is the main selling point here. Minor points of concern include Mushkin's refusal to divulge the flash memory configuration being used (as these could potentially change in future production runs) and the inability to recognize and take actions on the drive based on S.M.A.R.T features such as TRIM. That said, it is not really clear whether TRIM on SF2281 drives is really worth the trouble. In any case, there is inherent over-provisioning in the drive and the typical flash drive use-case rarely fills up the drive enough to cause extensive performance degradation. The pricing aspect is the final item on the table. The LaCie Rugged Thunderbolt is obviously costly because of the availability of dual interfaces (both USB 3.0 and Thunderbolt). The Atom comes in as the cheapest of the lot (after all, it is a typical flash drive). 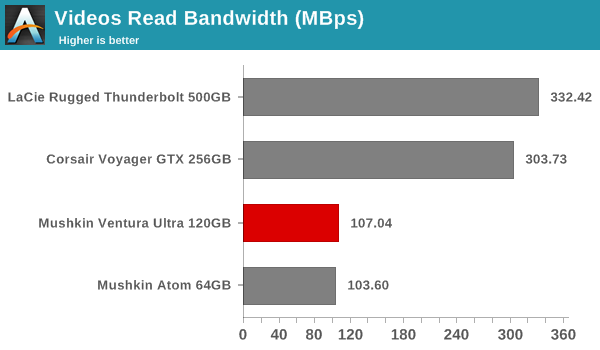 The Ventura Ultra, on a per-GB basis, is definitely more attractive than the Corsair Voyager GTX. 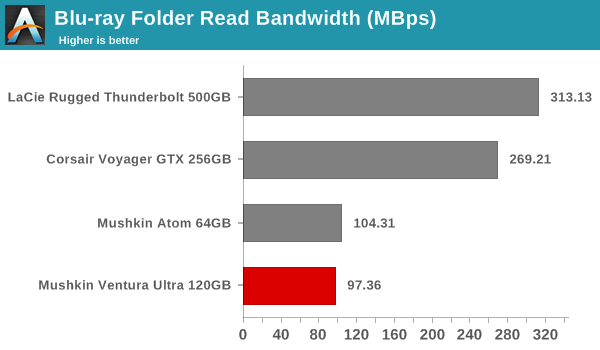 However, long-term performance consistency for heavy use-cases (not the typical flash drive usage scenario) may be in favor of the Corsair unit (thanks to TRIM support). Over-provisioning can be configured for the Voyager GTX also. In terms of absolute pricing, the Mushkin Ventura Ultra is available for $70. The 64GB Atom drive retails for $29. A typical SF-2281-based 120GB SSD in a 2.5" bus-powered USB 3.0 enclosure retails for around $90. The form factor of the Ventura Ultra, fortunately, doesn't carry a premium. This makes it easy to recommend it to users looking for a flash drive that can take full advantage of USB 3.0 speeds. I noticed you are using QD=4 in your ATTO benchmark run. 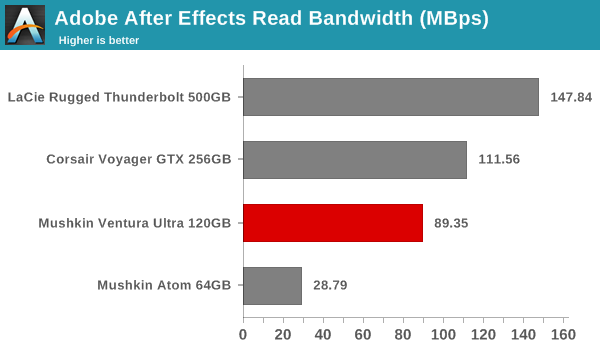 Were you able to achieve this QD in any of the other benchmarks? The 'throttling' is taken into account in the benchmark numbers. Our robocopy tests actually transfer the data contents to and from the drive three times each and the average is reported. The three different workloads are executed in succession - This process takes 30 minutes to 1 hour for a total data transfer of more than 250 GB. Workloads beyond that are not in the realm of what a flash drive might be used for.